Lucy:June seems to have been the busiest month yet! It started off with the Wildlife Discovery day at Forde Abbey near Chard, which provided an absolutely stunning setting for a really fun day. There was so much for children and families to explore (activities ranged from forest school to butterfly spotting and everything in between!) and it was really rewarding to see so many people engaging with wildlife. Later in the month a group of us went orchid-counting up on the Beacon; we were told if we could count 100 we’d be doing well, but we actually ended up spotting around 6000 orchids, and that was on only half the site! We had to cut the activity short however, as we had spotted several pairs of nesting curlews and didn’t want to disturb them any further. We also finally managed to catch some Great Crested newts! We spent an evening setting up bottle-traps, (accompanied by several unseen but very vocal nightjars) and, due to the hot weather, had to return to the pond to empty them at 5 am the next morning. Along with several palmate newts, we found over 30 Great Crested newts in our traps and it was really exciting to finally see them at last! Jon: June has been a fantastic month! The month began with a manic day at Forde Abbey as part of the Wildlife Discovery day. This was a fantastic event engaging children and families into the Devon ecology. I was manning the pond dipping sessions which was a big hit with the children. 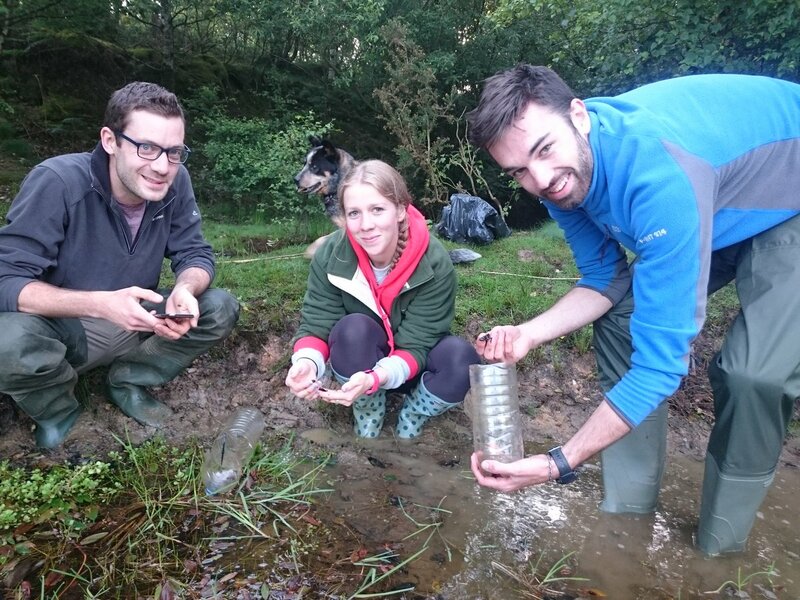 This month was the last month of the great crested newt survey season which meant a last chance to break the curse of the trainees and handle a number of GCNs. It is safe to say we struck gold! 39 newts in 43 traps so a very busy survey. We were also surrounded nightjars with their eerie birdsong, topping off the excellent survey. We returned to two woodlands for dormice box checks later in June. Although we had only found one dormouse at these sites the previous month with our new found luck anything was possible! In total we caught, handled and recorded 13 dormice including one juvenile and got chased off by one very angry hornet. This was my first time handling dormice but was really rewarding. I am looking forward to more dormice handling has the season continues. Kitty:June has by far been the most fun and my favourite month so far! It has been full of exciting experiences that I will never forget. 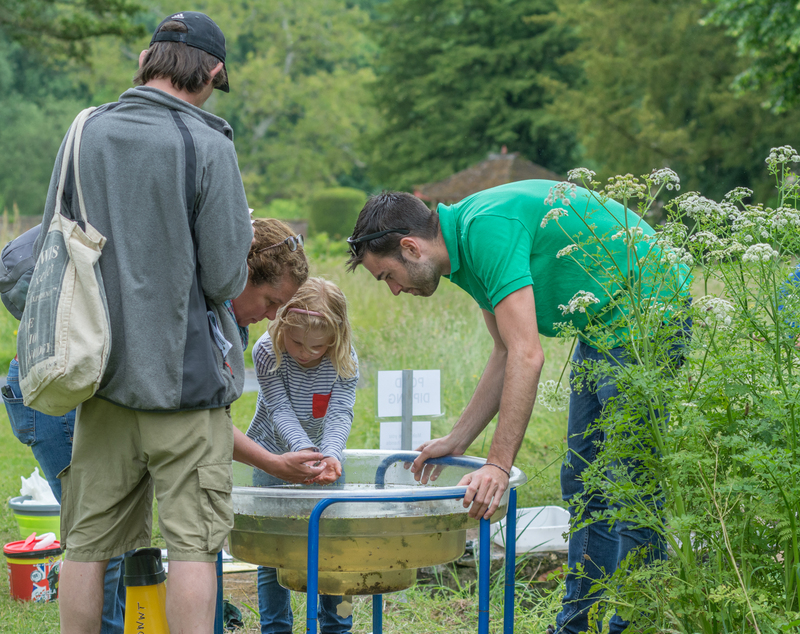 June began with the Wildlife Discovery Day at Forde Abbey, It was great to see so many children and families getting involved and up close with nature, there were a huge variety of activities available including pond dipping, bird watching, mini beast hunting and much more! This month we have continued with botanical surveys at various site in the Black down Hills but we have also had time for some other ecological surveys; In mid June we attended an Orchid count, we had a fantastic result and counted in excess of 6000 orchids; the survey was cut short due to discovering what appeared to be a breeding pair of Curlews. Fortunately we did not disturb them too much and they soon settled down and carried on as normal. It was great to see and hear the Curlews in there breeding territory! We also went to a local site and set bottle traps for Great Crested Newts... it was a great success!! Returning to the pond at around 5 am (as it was pretty hot weather and best to let any captured newts out as soon as possible) we proceeded to empty the traps....we had caught over 30 Great Crested newts as well as several Palmate Newts. That night we also heard several Nightjars close by in the woods, the first ones I have heard in the wild! My top day in June has to be Dormice box checking. We attended two woodlands and neither disappointed! Not only did we find plenty of adult Dormice but we also recorded two nest boxes with several juvenile dormice and one box with a torpid adult! It was a great day where I could practice my handling and monitoring skills; I think this day will be hard to beat!